For the last 27 years we have shared our lives, home and hearts with a number of cats, and as all you cat lovers know, we do not own the cats, they just agree to let us live with them. Here are their stories. Sophie is the newest (and youngest at about 8 years) member of our family, adopted in November 2007 when she was a year and a half. She had a long ride from the PetSmart in Greensboro, and not the smoothest initiation in the family. She arrived with her Daddy, followed by two members of the "adoption agency". It's no simple thing to adopt an animal these days. You have to give references, and fill out forms and sign a zillion papers. Not to mention having people come to your home (at least with this particular group). 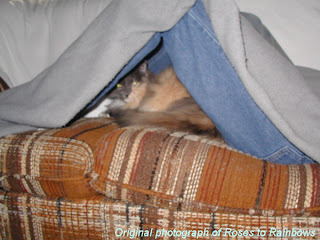 Rosie was not thrilled with the upheaval of his castle (and neither was his mama). We hadn't gotten our "meet and greet" area set up, and we couldn't just keep Sophie in the carrier. We had strangers in the house so this couldn't be done right then. Even though it would only have taken a few minutes, it took two of us to set it up. Sophie came out, and hid under the chair. Rosie, who loves all other cats, had his nose a bit out of joint at having a new "friend". After all, we had gotten her for him (ha). Finally, when we got our house back to as normal as it gets with a new cat in the house, we closed off one room, and put an old window screen up in one doorway, so they could get acquainted. There were some less than friendly sounds the first several days, but in less than a week she was integrated, and if they weren't friends yet, at least they weren't enemies. Sophie was 1 1/2 yrs. old at that time. Young enough that her personality was (and is) still developing. I find that with adopted adult cats, their personalities continue to evolve for a while, maybe indefinitely. The above picture is one of her favorite poses. It can't be just to look cute and adorable because she does it when she's all by herself. You'll walk into a room and there she is all stretched out on her back. Currently Sophie is the only feline member of our household. While she is friendly and loving with both of us, she is primarily my husband's cat. We are looking for someone special to take over for Rosie and Dood as my buddy. Following are the memorials for friends who have made their transition to the next life. 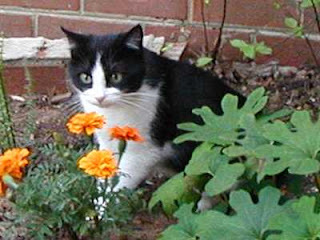 Charlie was our first cat. He belonged to my husband before we met. He likes to tell people I married him for his cat. Not really the case, but having the cat didn't hurt either. Now this was way before we had a digital camera, and this is the only photograph I have scanned at the moment. He had the most beautiful, big blue eyes. His hair was cream color with reddish-brown highlights on his face, ears and tail. He was referred to at the vet as "regal and stately". Until 1992, he was an indoor-outdoor cat. One of our neighbors had a couple cats, and one was particularly unfriendly to Charlie. He sometimes came home with scratches, but I bet the other guy looked worse. He likely could hold his own, but I doubt that he picked fights. He was a laid back, easy going guy (read "fixed"). Because of these adventures, he ended up with FIV, probably from the neighbor's cat. Thus he eventually became an indoor only cat - much to his distress (and everyone else's every Spring). He didn't mind being inside in the winter, but as soon as the windows were open in the Spring, he went from one end of the house to the other loudly proclaiming his desire to be OUTSIDE! Finally, he adapted. He was my buddy, and would sit on the arm of my chair during thunderstorms. One of my Mom's favorite "tricks" of ours was me laying down on the floor and Charlie coming up and laying down next to me. It was cute, but you kinda had to be there. Missy was the apple of her "daddy's" eye. I always kidded him that he'd do back flips for her. She came to live with is in the summer of 1994. Just wandered up from the woods. She talked a lot, and when we got her comfortable enough to catch her we took her to the vet. She was just a kitten - we estimated about 6 months - and very much in the family way. She was scrawny, having survived on whatever she could catch, and we were unsure whether she'd be able to take care of the kittens, and with both of us working, we couldn't do it. Sadly, we opted not to keep the kittens, and get her fixed. Her daddy made her a wonderful little recovery house because she needed to stay quiet while her incision healed, and at that point, Charlie was indoor only and they'd need time to adjust to one another. They ended up getting along well enough, but when Missy tried to wash both his ears from one side, he smacked her on the head with his paw. My opinion still stands that she was the most beautiful cat ever. She was a little tubby, usually weighing around 12 lbs. She was short in length and height. I said if she had legs as long as Charlie's she'd look like a beach house on stilts. She was a good communicator, though. She could convey her wishes by staring intently until you fixed whatever was offending her. For example, she wanted to lay under the Christmas tree, but there was a box in the way that was apparently blocking her view. When said box was moved, she proceeded to curl up and nap. Why the box was a problem, I don't know. After Charlie passed, enter Rosebud. As cats go, they weren't instant friends, but Rosie grew to love her, and mourned her passing for a long time. Early in 2001 we discovered a lump that turned out to be an aggressive cancer. After five surgeries (she was a trooper) and fighting many battles, she ultimately lost the war, and we lost her in December of that year. She wasn't quite 8 years old. 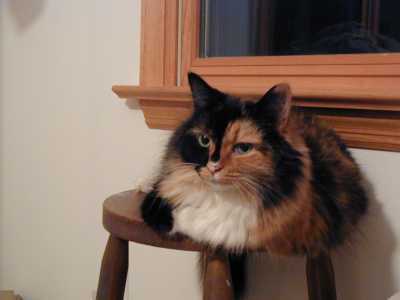 She was quite the pedestal cat, be it a stool, chair or just a piece of paper. She also enjoyed chewing on cardboard boxes. Red was an old Tom cat when we first noticed him. He started hanging around when Dood was first orphaned (his mom met with a car in front of our house). I've already related his relationship with Dood. Red, however, had his own set of problems. As I've said he was already old, or at least we figured by his appearance. When we were able to take him to the vet to be vaccinated and de-tommed, we discovered he was FIV positive. That was heartbeaking. 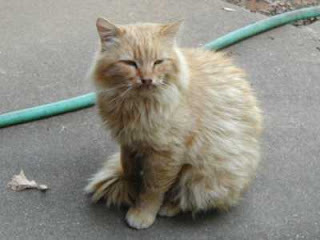 He was such a sweet cat, and once he learned to trust us he would follow us around the yard. He and I went for long walks around the back yard. Sometimes Dood would walk with us too. Red and Dood would lean into each other and "steer" each other. Due to his health issues, he also had hygiene issues, too. He was always dirty and not very fresh smelling. He had hair mats, too, because of his lack of ability to take proper care of himself. My husband was very good with him, gently grooming him, and drying him off when he'd sat out in the rain. His hair didn't shed water, also due to his ill health. By accident one day at the grocery store, someone's "Whiskas'" cat food ended up in my bag. I decided to try it out on Red. He loved it! It seemed to improve his quality of life, and he looked forward to it every day. He'd come from two yards away at the sound of my whistle for his special treat. He had several bouts with illness over his years in our care. He even stayed at the vet for a few days, but couldn't stay any longer because he wouldn't eat unless we were there. That's the way, apparently, for many cats. Finally, after another illness in 2005, he disappeared and didn't come back. I guess he figured it was time, and his time was up. Molly like to visit on the back of my chair. Molly came to live with us in April 2002, not too long after we lost Missy. She was 3 1/2 years old at the time. I inadvertently named her, or maybe I should say renamed her. We got her from the Animal Shelter, and they had named her Sarah. Well, that was my Mom's name, and it just didn't seem right. So one night I was sitting on the bed with Rosie, and happened to wonder what Molly would think of him. Thus she was named. 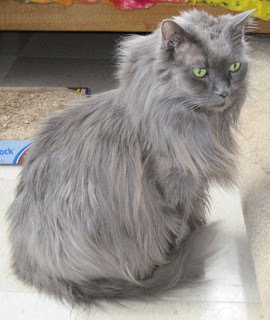 She was a dilute tortie and declawed on the front. She had been tossed out or abandoned three times. I guess the third time was the charm, and she quickly became a much-loved member of the family. Now Rosie was the resident cat, and Molly the newcomer. Again, it takes a little time to integrate a new member into the family, but they soon became fast friends. Molly's personality continued to evolve as she was more and more at home with us. She had her own little quirks, and each individually matched to her people. With me, she like to come visit me here at my desk. I would be sitting here typing away, and feel this patting on my leg. It was Molly getting my attention, to jump up and visit. 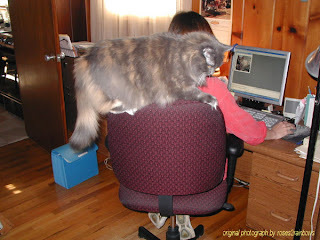 Quite often she would jump up and sit on the back of my chair. As with all the "girls", Molly loved her daddy. As she grew in her confidence that she was here to stay, she started show her interesting side. She was declawed on the front (we didn't do it), and she loved to pummel things, walls, doors, suitcases, anything that was vertical. She even enjoyed the scratching post and cardboard catnip scratcher. Never mind she didn't have claws. She was such a joy to have around. Another favorite thing she like to do was come down the hall as we were going to bed, and sit in the hall and "talk" to her daddy. She would peer into the bedroom, staring and talking, until he got up and walked her to the kitchen. He would pet her, she would eat, and that concluded the ritual for that night. Unfortunately, at the beginning of her fifth year with us (May 2007), we noticed a change in one of her eyes. Some of the white part was visible all the time, and she was diagnosed with Horners Syndrome, and given medication for that. For several months we thought everything was going to be all right. Her eye never returned to normal, but we could accept that if all else was fine. All else was not fine, though. She had many symptoms such as runny eyes and nose and fever. We had tests done, and tried a number of treatments. Then her lymph nodes began to swell. 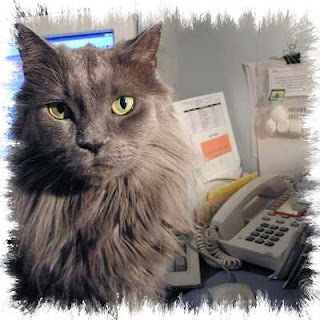 The final diagnosis was an aggressive Lymphoma, and we lost her on Labor Day in 2007. Right from the start I knew he was going to be a big cat, so he was supposed to have a big cat name like Nicholas, but that just didn't work out. He was definitely not a "Nicholas". He had this habit of sucking on everything, your shirt, your arm, the blanket, it didn't matter. Now he was just four months old when we got him from the Humane Society. I held him and he climbed all over me. I said "can I have him?" Obviously the answer was yes. We scraped together the $75 adoption fee, just barely. Back in those days (1997) you could just pay for your cat and take him home. Things have changed. More on that later. His name came from him not having a name and my husband calling him "Bud". I said he's more like a Rosebud, and thus he was named. Although that is his official name, we call him Rosie or Rose for short. The charm of him climbing all over you wore thin as it continued day after day. He still sucked. I threatened to "sell him down the river", but obviously, I didn't. Much to my regret, he spent nights confined to one room with his potty and other creature comforts, except for "mama". I was afraid he would keep us up at night, so I was reluctant to let him have free roam, because he bee-lined for the bedroom. Isn't that the way of cats. They never have to be told where the bed is. Anyway, after about...um...6 months, we decided he couldn't stay locked up at night forever. Turns out it was really OK. You just tried not to disturb him or he'd be in your face in a heartbeat. I found in Rosie a special friend, a bond not to be broken. He has become one of my best friends. He's not like any other cat we've had. He has a very sweet personality, but only likes "mama" and "daddy". We believe this stems from a visit by hubby's Dad, brother and nephew all at once. I wasn't home, and Rosie, who loved everyone, freaked out and has not been the same since. It is really nobody's fault, I don't guess, but I can't help but wonder if things would have been different if I'd been home. At 15 years he was showing signs of getting older. The last vet visit showed his sugar level was elevated and he is most likely diabetic. We changed his diet in hopes of controlling it without injections. 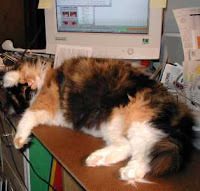 Feline diabetes does occasionally reverse itself, especially if it is food or weight related. He is not fat at just under 14 lbs. Did I mention was a big cat? Long body and long legs. When he was a baby, he had such big ears and paws for a kitten, I just knew he was going to be big. We managed to control his diabetes with food for all but a few months, and during that time we gave him insulin injections. Favorite food (besides cat food): Anything that crunches. He loves toast crust, pizza crust, cheerios, peanuts, popcorn, chips, etc. We called him our carb kitty. That was before the aforementioned vet visit. Most peculiar habit: Hmmm...well, he liked to "talk" to the other cats, and then bite their necks. This is not a mean thing. He was showing affection. We thought it was just something he did to the girls since until then his only feline house mates were female. Not so. He did the same with Dood as he did with Sophie and Molly. Here are some more pictures of my little boy. What channel is "Animal Planet"? Rosebud (AKA Rosie) passed away November 3, 2013. Rest in peace, my friend. We found out after his passing, that he was more special and rare than we knew. 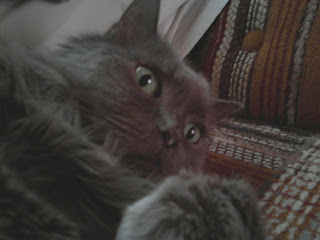 He was a Nebelung. Now he may not have been a purebred, but he definitely had the personality and characteristics of the breed. You can read more about it and watch the video here. Sometimes you just have to stop and smell the flowers. His is a heartwarming story to be sure. He was born sometime in the summer of 2000, maybe in our shed or the woods behind our property. He was a cute little bundle of black and white fur. His mother was gray and white. She was only around for a short time. She met up with a car on the road in front of our house. Now her baby was all alone in the world...or was he? We had been feeding he and his mother for a while, and now we were beginning to notice an older, red/orange Tom hanging around, hanging back when we were out there. It is known that Toms are not always friendly to, and sometimes even kill, kittens. Not in this case! The cat, who came to be known simply as "Red", became the kitten's protector. The world was a safer place, and Doodle (a.k.a. Dood) was braver when Red was around. We say that Red taught Doodle everything he needed to know about life in the great outdoors. They grew to be the greatest buds you could imagine. Since they were both outside-only cats at that time, sometimes they would disappear for several days. That always made us wonder where they were and if they were all right. They always came back, acting like they'd never been away. Who us? Before they came to be "our cats", another neighbor fed them, or at least Red. Doodle we've always considered ours since he was born here. When we first started looking after them, it was summer and all was fine. But then up came one of the coldest winters I'd seen in quite a while. And, as much as I dislike cold, windy weather, I spent more time outside that winter than I had in quite a while. 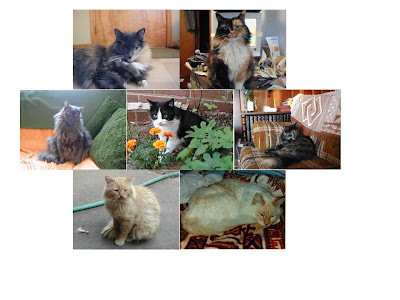 We had to tame these cats, most especially Doodle, so we could get them to the vet for shots, etc. Easier said than done, though isn't it. All you cat people know what I'm talking about. While Dood's mother was still alive, we borrowed a trap to try and catch her since she was probably the most skittish. We succeeded one day. Now what. How do we get her out and into a carrier without being shredded? Answer....we didn't. She shot out of there almost before the door was opened. We never got another chance with her, although we did catch a possum. They really do play dead, or perhaps he was just sleeping. Finally we gave up and returned the trap and just continued to make friends with them. As I mentioned it was cold that winter, so we went to Home Depot and bought some blue insulation board and fashioned a house using a utility knife and hot-melt glue. This was early in 2001. He and Red lived in that house for years. They were so cute in there together. Here is a picture of Dood in the house. 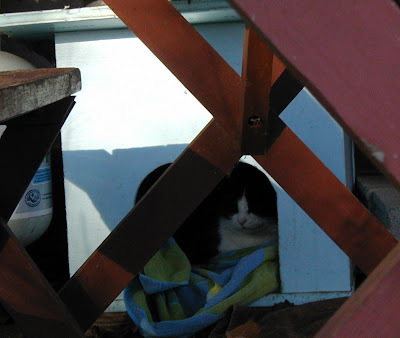 During the summers, they didn't need the house so we kept a shallow box with a towel in it on the picnic table under the back shelter and called it their summer house. Dood and his buddy Red in their summer house. Aren't they just the cutest pair? 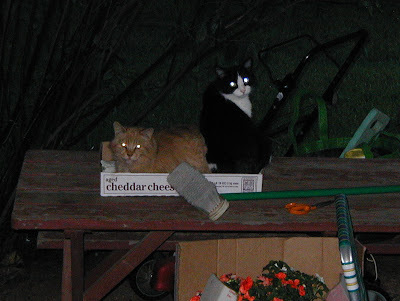 They enjoyed each other's company from the time Dood was a kitten until Red disappeared in February 2005. Dood eventually ended up inside due to being injured, probably by another cat. We feared he wouldn't adapt, having lived in the "big woods" for his first 7 years. How wrong we were. He is a major snuggle-bunkins, and sleeps on the bed with the rest of us. As fate would have it, this transformation occurred about two weeks after Sophie came to live with us. After spending the first several weeks in the basement, he came to terms with his new life and joined us upstairs. Dood enjoyed 7 years of absolute bliss being inside with his favorite people, 6 of which was shared with his buddy, Rosie, whom he adored. Sadly, Dood passed away on November 28, 2014 from pancreatic cancer. He was always the healthiest one of all. The cancer took us by surprise as he was checked out 6 weeks prior and the only thing found was a touch of arthritis. That was a shocking loss and he is sorely missed.